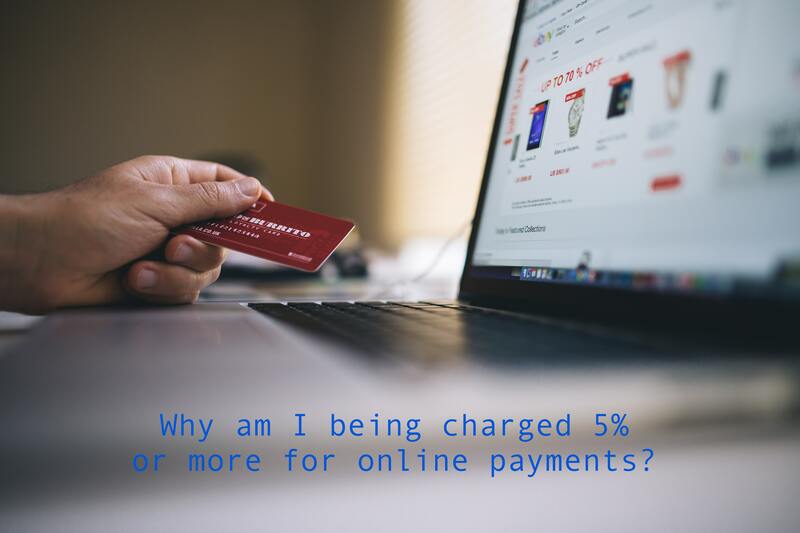 "Why do online systems charge between 3 and 10 or more percent for processing payments?". This is a question that we're asked very often so I thought I would address it in a post because it’s important when you’re comparing, that you’re comparing apples to apples. I’m going to look at this from a very fundamental perspective and group providers into 2 categories, Payments Standard and Payments Premium. I'll avoid getting into the details about merchant banks or payment gateways because it’ll make your head spin. Don’t believe me? Do a quick search on the web for “how does online payment processing work?” and you’ll find plenty of material attempting to simplify this fairly complicated process. In this post, I'll strictly focus on percentage based off the shelf solutions but you can view the guide on whether an off the shelf or custom solution is your best fit. I'll group this basic level of processing into what I'll call Payments Standard. For these additional services, you’ll be required to pay in addition of the the Payments Standard rate. If you're someone who has technical knowledge to put all this together by combining various services, you may be thinking, "it's a bit of work but it can be done". For others who either don't have the technical knowledge, time or resources, this is likely not your best option. So while PayPal and services alike, are excellent sources and providers for processing payments, if you’d like more than just Payments Standard and need a package with the additional services I’ve outlined above, you'll want to upgrade to a more comprehensive package. We’ll bunch these additional services into what I'll call Payments Premium. I should point out that there are options for replicating the services described in the Payment Premium offering which you can combine with Payments Standard to create a complete registration and payment system. The caveat being that the package you put together may be comprised of more than just a single platform or service. For example, you could use Google Forms to replicate the registration process and capture various information about your registrants. You can also build your own website where you can embed the Google form you created along with the payment button provided in Payments Standard. If you have the technical knowledge to make this work, this might be a suitable option however, it will cost you in your time and/or additional expenses. So let’s look at the diagram to summarize the differentiation between Payments Standard and Payment Premium. As an example, we'll focus on a 5% total charge per transaction (which is our rate at Checklick). To make sense of the value, let’s crunch some numbers for both the Payments Standard and Payments Premium options. 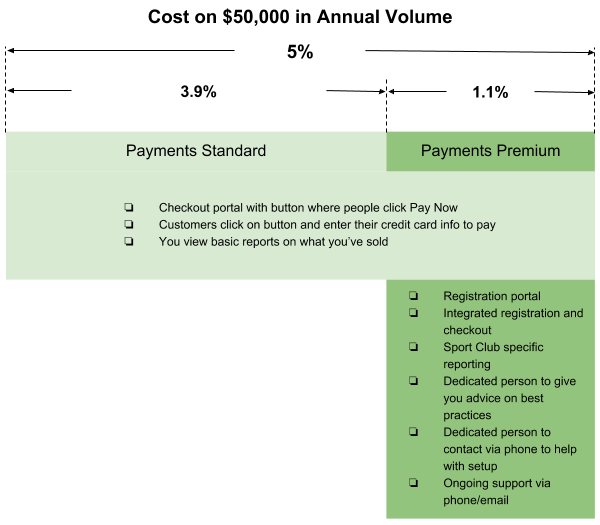 Comparing the costs of both payment offerings, we can see that for the Local Gymnastics Center, the difference in cost for Payments Standard vs. Payments premium on $50,000 in sales, is $570/year. If we assume that payments premium costs 5%, that means Payments standard in the $50,000 in sales volume above is costing the Local Gymnastics Center 3.9% ($1930 / $50,000 = 3.9%). Have a look at the diagram below. 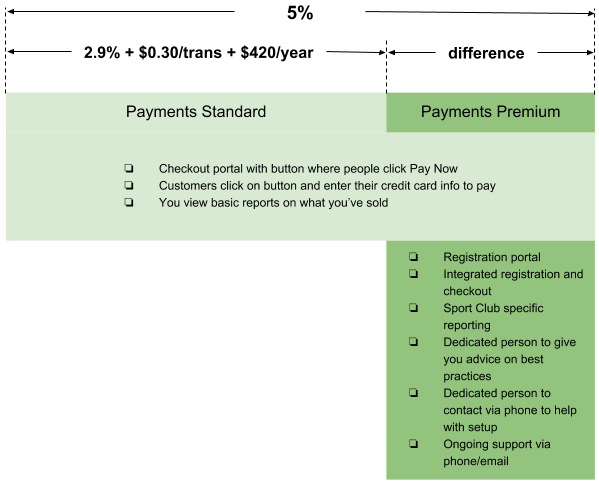 If you’re looking for a standard portal where your customer can go through a checkout and pay and you have the technical knowledge to put together a registration form and integrate it with the checkout portal, you can likely make do with Payments Standard. If the Payments Standard solution doesn't seem like a good fit for your organization, you'll want to explore a more integrated payment, registration and support solution that puts it all together and consider a provider who can deliver what we've referred to as Payments Premium.